Since 1999, Fairway has been family owned and operated, so we’ve seen firsthand what true customer service means as well as the value of keeping our standards high. Our membership program is another way we aim to provide better service. Our team prides itself on our ability to take care of our community, and this program allows us to be even more thorough and available to our clients. Through the program, we’re able to devote more time and care to our loyal clients, giving our all to each program member. Members receive a higher level of attention and priority and have access to all of our popular interior and exterior home services you see below. The below services are also available a la carte. Each member will receive a custom pre-schedule upon signing up for a membership. 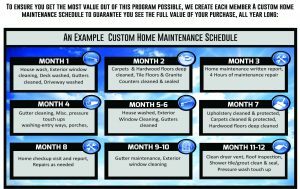 This ensures that you get value out of your membership and your home is maintained throughout the year. You are free to schedule any additional services and modify the schedule to your liking. At Fairway Home Detailing, we never want to spread ourselves too thin, so we’ve designed this program to give our commitment to a select group of loyal clients. Fairway is the only company of its kind to offer this in the Raleigh area, and we’re willing to be the first to provide this kind of superior service. Our program is priced starting at $145 per month and includes all interior and exterior home services mentioned above, all executed with the highest standard of customer service. When you work with Fairway, you get a team that takes just as much pride in your home as you do, so you know you’re in good hands. Click to see pricing plans for our membership program and get started.